I’m all for the purest red and pink Valentines Day dinner party, but this year I wanted to try something different. I think every cohesive party setup needs a color scheme and overall mood to really elevate it to something special. 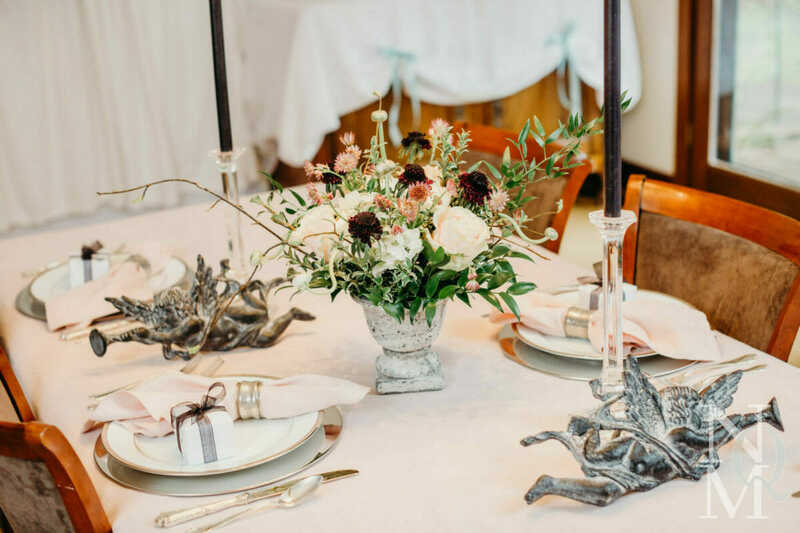 For this dinner party, I wanted a soft, mellow less traditional color scheme to give people a romantic, warm feeling but not have it be over the top. The “Be Mine” banner from Target (shown above) is one I’ve had for years and it’s a light-hearted touch to somewhat formal setting. The dark grey lettering with pale pink on the banner was my starting inspiration point. Target doesn’t have anything similar at the moment, but I did find one with a similar feel that if you added a dark grey or black string to would be very close. Or make your own with this cute free printable. The table started with a black satin tablecloth similar to this inexpensive black tablecloth found on Amazon. Then over the black cloth I layered a pink linen cloth similar to this Williams Sonoma one. This cloth is also similar but much less expensive if linen doesn’t matter to you. I then used safety pins to create the swag effect; I’ll give you DIY instructions at the post’s end on swagging. Next came the small, special touches. Little gifts are fun to put at each place setting, and you could add little “To:” tags and they become place cards. Inside each box is a single, delicious truffle that I picked up at Fran’s Chocolates, a favorite candy shop in Seattle. I found that the black organza ribbon was a great match to the color scheme because the sheerness of the ribbon gave the same affect as a grey yet has a very light, soft feeling to it. Another fun addition is the tassels—they add color and a touch of whimsy to my formal chandelier. The place setting itself consists of a simple platinum band china that we got for our wedding which is now is discontinued. A similar, moderately priced option is at Crate & Barrel who also sell the silver charger shown. I used my simple bell-shaped wine glasses and a rosé wine by Gerard Bertrand (Cote des Roses) that I picked up at Target. The wine bottle is perfect by the way for Valentines day: it’s a clear bottle showing the pretty color plus the bottom of the bottle is shaped like an opened rose. The Vence wine glasses by Baccarat are also discontinued (I seem to be the kiss of death to patterns haha!). But you can find similar ones at Target or Wayfair. I felt like the flowers needed to be particularly elegant and while I had a vision in my head of what I wanted them to be, my floral arranging skills are not quite up to that level of finesse…so I reached out to Herban Bloom, a fantastic Vashon florist. Tip for saving money on arrangements: if you patronize the same florist and develop a relationship with them, they often will be kind enough to loan urns and vases instead of requiring that you buy them. Since nicer vessels will seriously bump up the cost of an arrangement, I am very appreciative and loyal. I’ve done this before in (less neighborhood-oriented) Seattle as well and left deposits on borrowed vessels in case they get damaged. One of the final touches you see are the silver napkin rings that I’ve collected for many years. If you’re looking for something fun and easy to collect, I’d recommend them. They’ve been a great collection item for three reasons: (1) almost every where you go has flea markets or antique shops so you can get souvenirs that represent almost any trip; (2) they are tiny thus easy to get home and (3) are also easy to store. Last, I found the cherub wall plaques years ago on the great website called Wisteria but they’re of course also discontinued. I was able to find a really cute substitute for you at Lowes for $32.90. Or check your local garden store for grey cement look garden statues—cherubs are a common garden theme. I hope the dinner party gives you ideas to elevate your Valentine’s Day! Message me if you have any questions or feedback. Tutorial: Swagging Tablecloths on You Tube.